With three quarters of area covered with forest, forest management is of great importance in Finland. 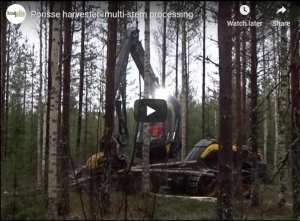 So how is thinning being done in Finland? 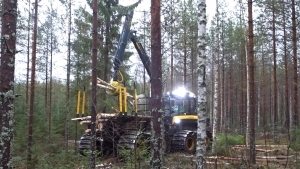 TECH4EFFECT members had the great opportunity to see a Ponsse Scorpion harvester and an 8-wheeler Wisent forwarder in action close to Joensuu during the last consortium meeting. The operators not only showed great skill with their machines, but also gave insights into their work. The harvester operator confirmed great visibility conferred by the design of the Scorpion. He commented that there are still some 6-wheeler forwarders in use but 8-wheelers are now the rule, not the exception. Watch the videos from the operation!